I served in the Peace Corps in Ukraine from 1993 to 1995 teaching English in a town a hundred kilometers or so west of Kiev. You're welcome to read a draft of the brief introduction to my book about serving in Ukraine, titled On the Heavy Side of the World: My Journey nto the Heart of Ukraine, soon to be published. Madeleine Albright, and many volunteers who served all over the world. To get a free copy, call the Peace Corps at 1-800-424-8580. Kathleen Ivchenko's Page excellently tells (and shows) what it means to volunteer to teach in Ukraine. She liked living and working there so much she married a Ukrainian man! Wedding pictures included. 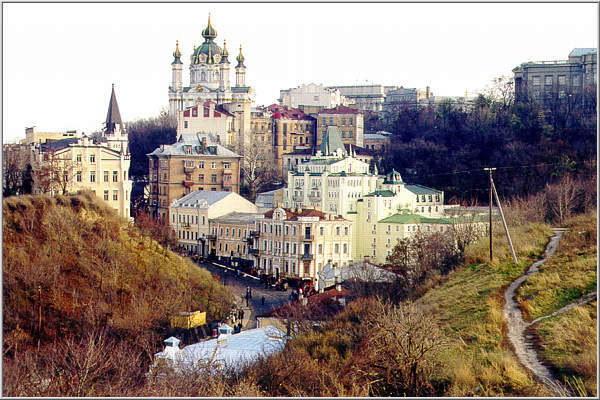 Hippocrene Guide to Ukraine has updated travel and cultural information. The "Official" Peace Corps Home Page has a nice map showing where volunteers lived. Also displays at great length the Country Director's resume! 4.or www.tifft.com for a lengthy exhibition of excellent photographs of Ukraine. Explore the links below for in-depth information about Ukraine. See www.infoukes.com for a comprehensive site posted by Ukrainian Canadians, including information on Ukraine's 1932-33 famine artificially created by Stalin. See Ukraine's Yellow Pages has links to organizations and companies in Ukraine. See scientific investigation and many images of Chornobyl. See U.S. Embassy site with information for Americans who want to visit. See the Ukrainian Map Server, the great big detailed map or a good basic map with links to others. Also, don't miss out on Taras Shevchenko -- the greatest poet of Ukraine! This Returned Peace Corps Volunteer WebRing site is owned by John P. Deever.